No one needs me to tell them that this has been a wet spring and now early summer. Most grapes are approaching, in, or maybe just exiting bloom across the state, and disease pressure continues to be possibly the highest of the season. Fungicide coverage should be maintained on 7-10 day intervals, depending on rainfall (1” removes about half of a material from the canopy, 2” and you’re no longer covered at all). The diseases of concern right now include all of the major ones: black rot; phomopsis; powdery mildew; downy mildew; anthracnose; and botrytis, so make sure any materials you apply cover the whole spectrum. Spray choices should include a contact material like Captan or a mancozeb (probably the last chance to use the latter, and watch the long preharvest interval); plus a second specific activity toward Black rot, downy mildew, and/or powdery mildew, like an SDHI (Luna Experience); strobilurin (Flint or Sovran); DMI (Rally, Tebustar); or a combo material like Revus Top, Pristine, or Inspire Super. Be sure to rotate between fungicides, never applying anything other than sulfur, copper, Captan, or mancozebs in more than two back-to-back sprays. For organic growers, this is going to be a difficult season. Sulfur may be used now but will really only manage powdery mildew; copper materials may be the most effective against downy with a little activity against powdery and black rot, which will continue to be very hard to manage on an organic schedule in this wet year. 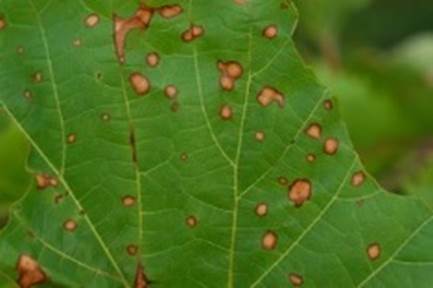 Sanitation must be performed regularly to reduce disease inoculum in the canopy, that means pulling every leaf with visible lesions as it develops and destroying it. In a year like this, you may face significant vine defoliation using this method, but it will be your first line of defense. Other than disease management, this is a great time to work on weed control and training young vines to the top wire. Canopy management should take a back seat for now, at the shoots are not lignified at their bases and thus are quite brittle. This entry was posted on Monday, June 26th, 2017 at 6:21 am and is filed under Grape, IPM. You can follow any responses to this entry through the RSS 2.0 feed. Responses are currently closed, but you can trackback from your own site.